Thank you for visiting DealerWorks. After nearly 10 years we've decided to close the doors to new DealerWorks package websites. The company behind DealerWorks (2Dmedia) is very much thriving and has grown from a team of 2 back when DealerWorks started to a busy team of over 20, but our business and focus is now on high-end bespoke sites and eCommerce projects. The good news is that for all of our existing clients we will continue to provide the CMS and hosting services behind your DealerWorks website indefinitely, so nothing has changed for you, same team, same servers, same service. Our team is still on hand for support and enhancements too, just use your existing Portal system and our normal number. However, we're not accepting any new orders for package based dealer sites, but if you're looking for a bespoke site, please do drop us a line or visit www.2dmedia.co.uk. We offer a number of upgrade options for your car dealer website, ideal if you need a couple of extra features. These upgrades can help boost the effectiveness of your car dealer web site, improve sales and make your site even better than your competition. Make your homepage stand out with an animated 'sliding banner'. The banner can contain up to 5 different slides (pictures) which slide one to the next and then back to the first, keeping the page looking fresh and allowing you to feature several eye catching pictures on the page. It's easy to build your own pages via the CMS panel, ideal for extra information about your business. If you would like a page with a more custom, vibrant and professional layout design our team can create it for you. We can also build on custom features if required too, beyond simple text and images. Don't forget adding extra pages yourself is free and easy! If you would like to collect more customer information, such as details for a credit proposal, a vehicle request or booking for a garage service, a custom enquiry form is the ideal way to capture the lead. With a custom form you can specify exactly the fields you need. The trader upgrade includes up to 10 fields. You can easily add normal content pages, but if you need to regularly add articles - whether they be company news or informative editorials, or even a service page with text and a picture - an article page allows these to be easily added, sorted and shown in a list. Each article has it's own page, linked to automatically from the list page. A popular upgrade if you sell products, accessories or parts or just want to create a range of service pages. This page consists of one or more user-definable categories that list your products in a grid, which can be clicked to view the product page for more details. If you like, the pages will generate and display a PayPal 'Buy' button too. Adding products is quick and easy via the panel too, so keeping the catalogue up to date is a breeze. You can add pictures to any page with DealerWorks, but for lots of pictures, a Gallery looks much better and allows your visitors to click on the picture to see a bigger version too. Your gallery can be viewed as a slide show as well. The vehicle listing pages have a gallery built in, but this feature is popular with companies that provide services like valeting and restoration or those that just want to display plenty of related pictures for visitors to enjoy. If you would like to display videos of your vehicles then this upgrade makes it easy. Simply upload your vehicle video and it will be displayed on the vehicle page along with the vehicle pictures. The videos show in an unbranded player too, so there's no risk of your visitors clicking links and leaving your site. If you have lots of vehicles in stock your site will benefit from an easy to use "Search" box allowing visitors to enter a word such as a make or model and see vehicles with matching titles (performed as a text search on title field). This	upgrade	also	includes a sort feature so visitors can choose to list vehicles in order of either Title or Price. Our team will be pleased to make you a logo for your website if you don't already have one (no extra cost). Should you wish to use the logo in other areas of your business you will benefit a logo pack, this includes your logo in a number of formats including high-resolution RGB JPEG, PNG and a PSD (Photoshop). In most cases an EPS can also be provided. The logo pack includes the license to use the logo across any media within your business. Mobile site optimisation is becoming increasingly popular and can be a very effective addition to a well developed and marketed website. If mobile users are an important market, a premium mobile optimised site will set your site apart from the rest. Your content will be displayed within a specially designed mobile layout complete with optimised graphics and styles to give a high end, tailored experience. This is called 'responsive design' and requires that the design scale and shift around to suit the size of the viewing window. This allows the page content to fit snugly within a small iPhone screen, an iPad or similar tablet screen, right up to a full sized computer monitor. or £795 +VAT for an existing site. You need to add a VRM credits package to use the vehicle data lookup service (provided by a third party including DVLA data. The credits are reset each month, the 20 lookup per month package is £99+VAT per year. This option is available to Premier packages only and data is only available on UK registered vehicles. Subject to third party data availability, DealerWorks are not responsible for the availability or quality of this data. If you need to change the domain name and branding for your DealerWorks website we can offer a reduced price re-brand service if you wish to keep the same structure and features. If you wish to change the site entirely we recommend taking a new site package. This covers the setup and configuration of the site on a new domain name, a new logo and logo pack and up to 45 minutes of related changes such as editing fixed text elements or those within graphics (it will not be possible to change the site style, colours or layout within this time). Further changes charged by the hour. Because your web site will use DealerWorks software and is designed by our team, it's industry standard to display a small link in the footer. These small links help other companies find out about us after seeing your great looking website. These links are valuable to us and they are one of the reasons we offer the package at such a great price. If you require a website without such a link this upgrade allows you to remove it. With DealerWorks it's possible to do your own search optimisation because the panel includes all the features you need to set META tags, titles and control content - so all sites are set up and built for optimisation. The internet is a competitive market though and sometimes it takes more than the basics to achieve top rankings. 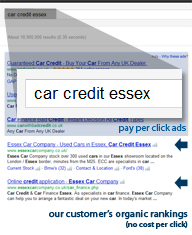 This is where our expert team of SEO's can help, just search for "car dealer website design" and you'll see we're right at the top of the organic (non paid) results... so we know what we're doing! Premier - If you would like a fully managed optimisation campaign we can provide a 6 month service that includes an organic search marketing plan, regular review, content optimisation, implementation of all our recommendations and initial link building. The built-in CMS lets you make changes to your pages text within an editor, you can control META (title and description too) plus file-names are created based on the page name automatically (SEO friendly). Need custom changes to your sites HTML and other coding changes not covered by the CMS? Our team of developers are happy to make extra amendments for you to your sites code, including extra SEO changes or other alterations/bolt-ons - this work is charged at £60+VAT per hour (minimum £30+VAT). If you would like any other feature not listed here please contact our team, we'll be happy to give you a quote for custom design or development work to make your site perfect for your business. "Dealerworks grasped immediately the direction I was looking in going and the designer took the time to get to know a little about me and the type of customer I would have." "We have worked with Dealerworks for 18 months for website design, hosting and e-mail services, and always find them enthusiastic, progressive and extremely professional." "Our website helps bring in new customers and gives us a professional image online, this was particularly beneficial following the searches for us after our appearance on Channel 4." "The service I had was first class and all members of the team were very helpful and everything was very well explained. We have been more than happy with the extra business we have gained from the site so far."